Surgery is over! Dr. Weiner just came out to let us know that everything went as planned. He was able to map motor responses which was an unanticipated bonus. He removed the remainder of Gabrielle’s frontal lobe, all the way up to the primary motor cortex, and about half of the right temporal lobe. We should expect at least temporary left-sided weakness. 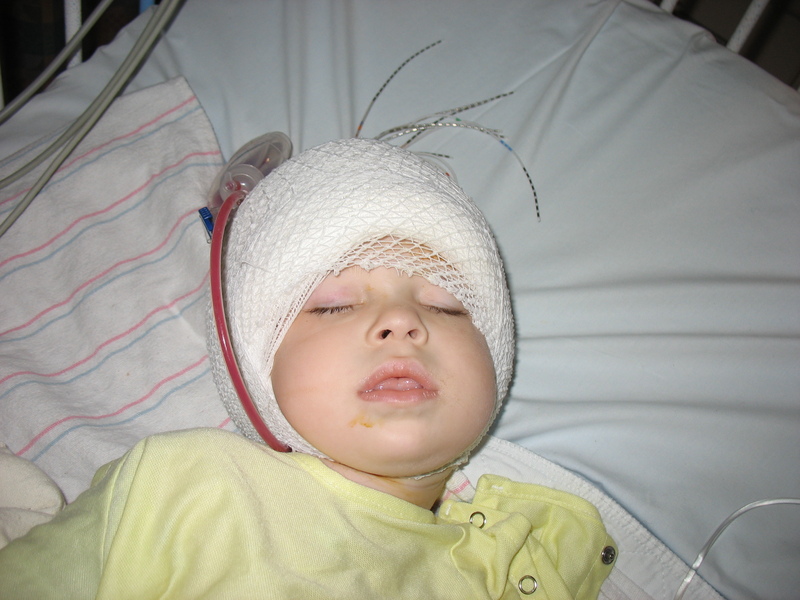 He moved the grids and electrodes over the remaining right hemisphere to monitor for any further seizure activity. If these areas continue to produce aberrant electrical activity then the final stage may require a complete disconnection of the right hemisphere (hemispherectomy). So now the waiting begins. I’m praying that regardless of the outcome we would remain strong knowing God’s perfect character. Knowing He is all good and His plan truly is what is best for each of us. Thank you for praying today and for the messages of support you have sent. It means so much knowing we are surrounded by so many loving and caring individuals! That sounds like good news. We’re praying for no more seizures and a beautiful recovery. We love and admire your whole family. What lucky children you have! Great news that surgery is over and that it went well. We will continue to pray for no more seizures and that Gabrielle recovers fully from the surgeries. Wish I was there to give you a great big hug! Yahoo! We’re waiting along with you and praying too. Give her a kiss for us. We hope to hear wonderful news as soon as possible. What wonderful news! I would say that finally you can take a breath, but I know from personal experience that you “hold your breath” just watching and waiting and hoping and praying that you don’t see anything after so long of watching every moment waiting for another seizure! I pray that finally Gabby and your family will know a life that is seizure free! Thanks for keeping us updated! I’m sitting here at a loss for words. Your faith and trust and strength and hope and love and constancy are truly awe inspiring. We love you all so much. You are and will continue to be in my thoughts and prayers always. May God continue to bless you all with his perfect love. Prayers are with you step by step!! Wish we were closer so we could see you guys and the kids. Great news on being able to do the bonus mapping! We are continuing to pray for you all. We wish we could be there to support you and love on you in person – but know that lots of hugs and love is coming in your way. Our God is good – we continue to pray for Gabrielle and for God to guide you and the doctors on every decision made for her medical care. We can definitely see God through you – you are amazing people! We continue to pray for Gabby. Continue to remember that our Lord is perfect in thought. Joshua 1:9 says “Have I not commanded you? Be strong and courageous. Do not be terrified; do not be discouraged, for the Lord your God will be with you wherever you go.” Much love!